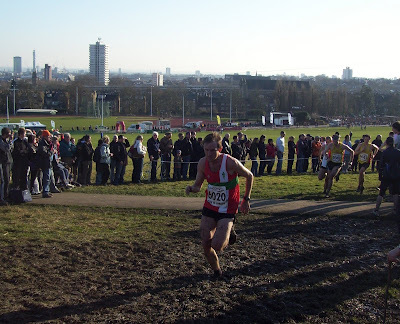 This weekend I kicked off 2009 with the national cross country championships and Interland. First up on saturday was the xc, and after a 2 year break I was ready to resume mudrunning with a new club - Aldershot, Farnham and District AC (one of the top clubs in the country and close to my hometown). I was quite nervous before the start of the 12km race, partly due to my large training load this winter which simultaneously made me feel that I should not be at my best, but also that I was running more and faster than ever before. and also because after 2 years, I could still remember how much these races hurt. 1500 men lined up on the start line on a beautifully sunny day on Parliament Hills in northern London. 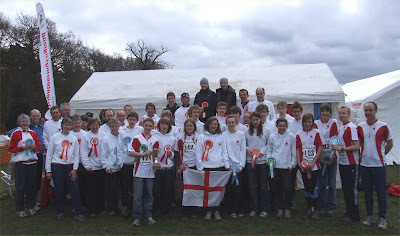 My goals were to try and run a smart race, finish as the best orienteer and come easily inside top 100. The first 400m were all uphill, and I had decided to take this easy and then push off the top as most people kill themselves and get into oxygen debt for a good start. I felt this really paid off, and although perhaps I could have had a better result pushing from the gun, I ran the whole race feeling 'comfortable' (although that word doesnt really apply!). Easily outside the top 200 at the top of the hill, I was then able to stretch out, and spend most of the first 7-8km overtaking people. The course was pretty ideal for orienteers, very undulating with some pretty steep climbs, and very deep mud after 9 other races before hand and then 1500 guys! Part was even in a forest round some trails. On the second lap, I had settled into a position just outside the top 50, and overtaking became much harder, but with a couple of kms to go and some big climbs I kicked in and got up into about 42nd on the last bend. Unfortunately a combination of no really fast work this year, a high training milage and those last climbs meant I had nothing in the home straight and was killed on the run in to finish 48th (41.23). Despite this disappointing finish, overall I was very satisfied with my race. I was 6 seconds from top 40, 33 seconds from top 30, and 61 seconds from top 20, so I feel that with some decent prep for the race, and maybe a couple more xc races under my belt, top 20 is an achievable target. I was also top orienteer, with Rob Baker next in 86th. My legs then had 18 hours to recover for the first international race of the year - Interland. An annual match between England, Holland, the various parts of Belgium, and sometimes (although not this year) the west part of Germany. This year the match was held in England, very close to my hometown, so I couldn't turn down the opportunity to run in one of the forests I remember from my childhood. Despite the exertions of the previous day, I was really motivated to have a good performance, and although my legs felt a little sore when I warmed up, in general I felt strong and was able to run fast. I had a good race, only losing some time at the 22nd control when I lost my direction a little, and finished the 15km in a little under 74 minutes. I was the first finisher, and I had to wait for all the other runners to come in. Craney and Barrable were a couple of minutes behind, but Fabi was ahead of me at the radio control, and it was a nervous wait for him a the finish. Finally he came in, having lost time to me in the last part of the course, finishing around 1 minute behind me, but he had been running so fast in the start! At the 16th control he was already 1 1/2 minutes ahead and I had been running really good! Anyway, a nice race in a beautiful forest, a good performance and another victory for myself and for the England team :) A good start to the year. My parents garden in Surrey! After that I have been visiting a few friends, doing some really good training and enjoying being in the UK for a change. Things I have been doing include some running in the Peak District, joining a new running club, Aldershot, Farnham and District Athletics Club, getting back into some climbing, and last weekend I went out to southern Sweden for a TIOmila camp with Lidingö. It was a really good camp with some quality training sessions and a really good atmosphere, but unfortunately there was 5-10cm of snow, and it was bloody freezing! Down to minus nine in the mornings.